Check in to the RCARA Public Service Net tonight, 7:00 p.m. on the w6tj repeater. Thursday, November 8th is the final FORMAL meeting of 2018 for RCARA. It is probably one of the most important meetings of the year because elections will be held for the new Board of Directors for 2019. Please consider volunteering or nominating someone who is willing to be a part of the planning and implementation of club activities. Without these dedicated members, RCARA could cease to sustain the status of an outstanding and functional radio club. Nominations can be made from the floor at the November meeting prior to the election. Annual Club Dues for 2019 are coming up. There has been a change in the dues structure and amount as well as in the application methods. You can find the information on the w6tj.org web site in the Club Membership Link. 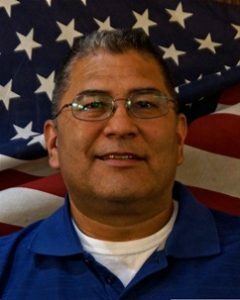 November 8 is the last day to submit your nomination letter for the Harry Crawford W6TJ Memorial Award or the LEJO Perpetual Award. The Annual Christmas Party is scheduled for FRIDAY, December 14, 2018 at Kountry Folks Restaurant, 3653 La Sierra Avenue, 6:00 p.m. Further details on the web site in the Upcoming Events link. Michael McBride K6MJM has come up with an “On Line Tech Class” using specialized software and will share details at the meeting. We will need a couple of volunteers to assist. Several of us meet prior to the meeting, 4:00 p.m. for dinner at the Kountry Folks Restaurant before proceeding on to the meeting. Everyone is invited to join us. Tuesday, November 13 the Hungry Hams Lunch Bunch will gather at the Back Street Café, 3735 Nelson Street at Brockton, 11:00 a.m. Join us for some further socializing and camaraderie. 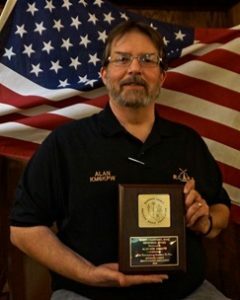 Your attendance at the November meeting is very important for the reasons stated above. I look forward to your attendance and participation. History of the LEJO Perpetual Award. The Award is presented each year for exceptional, dedicated and/or accidental service to the amateur community. The handcrafted 10-pound iron keyer was the original idea of Lee Owens, WD6DGI(SK), in 1978. Lee, known for his ingenious handy work, presented the keyer to Joe Brown, W6UBQ(SK), while he was in the hospital recovering. Joe was so impressed with the novelty of the keyer, he decided to present it to the club as a perpetual trophy for others to enjoy. Hence, the LE (for Lee) JO (for Joe) award was conceived. Selection Criteria. 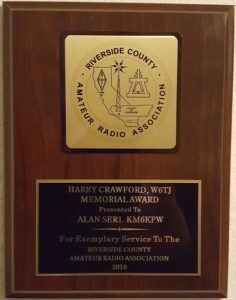 Criteria for the award includes: being an active member in the association; activity must have been unusual, unique or unpredictable; recipient must agree to return this key to the club at years end and to be a member of the selection committee for the next recipient; recipient shall be an average person, like the rest of us, who may have been at the wrong place at the right time or vice versa and agrees to bring the award key to each club meeting for use by the presiding officer as a gavel. Selection Committee. The selection committee consists of the W6TJ Trustee, the Club President, and the Previous Year Recipient. 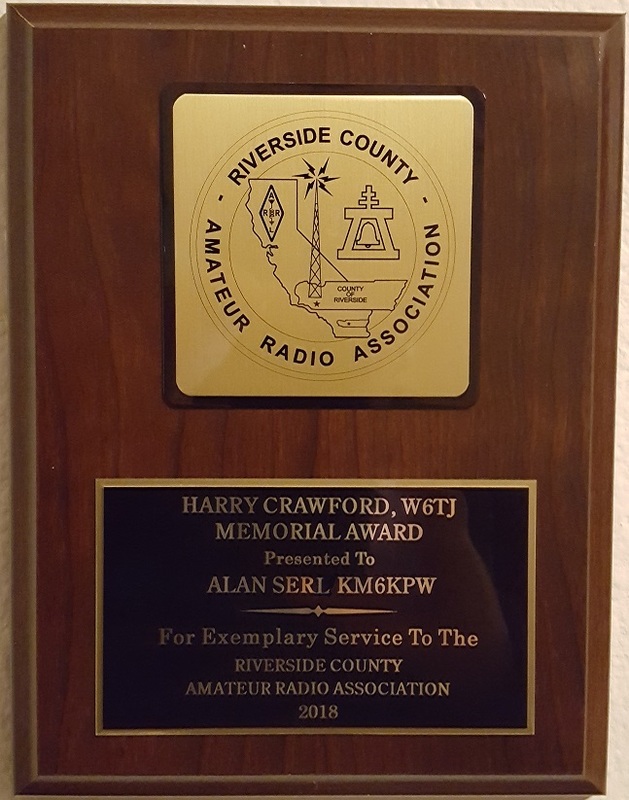 The Crawford Award recognizes a member who has displayed outstanding and exemplary service to the amateur radio community throughout the year.